You Will Fall For The Alien Heroes In This Wacky Space Opera Romance! 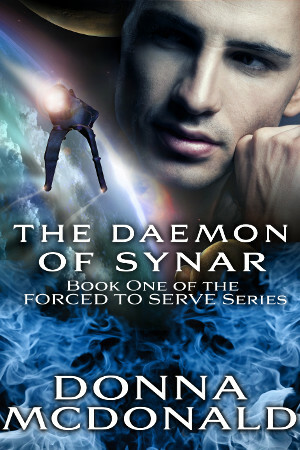 Being the captain of the Liberator for many years, Liam Synar is familiar with fixing mistakes. But he's not sure how to fix the worst one he’s made concerning his official mate. Merging Ania with Malachi, the Synar family’s daemon had been a desperate act to save her life after she'd all but died saving his. Since Ania being dead is not an option in his reality, how could saving her be wrong? Not telling her what he did? Okay, that definitely wasn’t the smartest decision he’s ever made. Leaving her and the Daemon of Synar behind on her planet had been for the good of all. Or so he's been telling himself over and over for the last two years they've been separated. Things have changed though. His time of keeping Ania unaware of her symbiotic host has run out. Coveting Malachi's enormous power, Conor Synar, his exiled brother, hunts his ship. His brother wants to control the powerful and destructive alien force and won't stop until he's the master. It’s only a matter of time until Conor discovers the truth. Liam understands now that the only way he can truly protect Ania from Conor's evil is to keep her by his side. That leaves Liam no choice except to tell his mate what he's done, even if it means facing the wrath of the only female he’s ever loved. Everything he did was to save her. How impossible is it to hope Ania might one day forgive him?